This article is about the monorail line at the Disneyland Resort. For monorail lines at other Disney theme parks, see Disney monorail. The Disneyland Monorail System (originally named the Disneyland ALWEG Monorail System) is an attraction and transportation system at the Disneyland Resort in Anaheim, California, United States. It was the first daily operating monorail in the Western Hemisphere. Historical Disneyland Monorail Plaque located at Tomorrowland Station. Walt Disney originally envisioned the monorail as a practical form of public transport for the future. However, the monorail came about during a time when America's—and particularly Los Angeles'—obsession with the automobile was increasing, and monorails in the United States were mostly only located in Disney's theme parks, with the exception of the Seattle Center Monorail. The job of building the monorail was originally assigned to the Standard Carriage Works of East Los Angeles, but in late 1958, Walt Disney, pressured for time, moved it to his Burbank studios. Disney designer Bob Gurr then headed a Disney team that designed and manufactured the cars, chassis, suspension and propulsion systems, thus completing the Red Mk 1 just in time for the re-dedication of Tomorrowland. The Disneyland ALWEG Monorail opened on June 14, 1959, as a sightseeing attraction in Tomorrowland in Disneyland, along with the Disneyland Expansion with the Matterhorn Bobsleds, the Submarine Voyage, the expanded version of Autopia, and the Motor Boat Cruise. The Mark I trains (Red and Blue) consisted of three cars each. In 1961 it became a true transportation system when Tomorrowland station was lengthened to accommodate the debut of the four-car Mark II and the additional new Yellow train; the track was extended 2½ miles outside the park and a second platform was constructed — the Disneyland Hotel station. In 1968 Mark III Monorail Green joined the fleet, and both platforms were lengthened for the arrival of the more streamlined and efficient five-car Mark III monorail train conversions. From Hotel Station there were two trips above Disneyland available aboard the monorail — a quick tour and general admission. Guests wishing to embark upon a vista-dome view of the park, including a leisurely layover in Tomorrowland within the tail-cone could purchase an exclusive round-trip tour ticket at Hotel Station and save the expense of general admission to Disneyland. Nose and tailcone door latches were independent from the main door release button. A simple dial indicator above the tail-cone compartment door could be turned to one of three positions — General admission guests, round-trip only guests, and mixed. Hostess attendants at Tomorrowland Station would check the dial position and open the door for general admission guests. If general admission guests boarded the tail-cone in Tomorrowland, the dial would be set to mixed, then all mixed tail-cone guests disembarked at the hotel. By the early 1980s, the Mark III trains were showing their age and the wear of years. In 1985, Disneyland began phasing out the Mark III trains one by one. The older trains were stripped to the chassis and rebuilt as Mark V trains. The Mark III Green went first, to become the Mark V Purple followed by the Mark III Yellow becoming the Mark V Orange. The Mark III Blue remained blue (albeit a lighter shade) and the last was Red, remaining Red. The notable difference was the loss of the bubble-top driver's area in favor of a streamlined "Learjet" look similar to the Mark IV trains at the Walt Disney World Resort. The new trains also sported closed passenger compartments (with windows that could be opened) and pneumatic doors. Following the 1985 Disney World monorail fire, a safety handrail was added along the spine of the train, as well as emergency fire exit hatches leading to the roof. 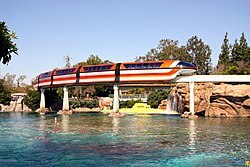 The attraction's name remained the "Disneyland Monorail System", as it had been painted on the Mark III trains' skirts. The Mark V trains were built by Ride & Show Engineering, Inc., incorporating bodies that were produced by Messerschmitt-Bolkow-Blohm of Germany. Purple first made its appearance for testing in Autumn of 1986 and began regular operations a few months later. Orange was delivered in late Summer of 1987, followed by Blue in early 1988. The oldest train, Red, was also the last to be removed from the line for refurbishment in the Spring of 1988. Mark V Monorail Blue travels over the former Submarine Voyage in 2002. The beamway path was re-aligned into the Eeyore section of the parking lot in 1994 to accommodate the construction of the Indiana Jones Adventure show building. The trains were fitted with new electrical pick-up shoes and tail view cameras, enabling two-train point-to-point shuttle service where the first arriving train was disembarked, moved along empty to just beyond the station, the second train arrived, disembarked, embarked and dispatched so the first train could be loaded and dispatched for the return. In 1999, the monorail began lengthy periods of closures due to construction of the Disney California Adventure theme park where the monorail beamway passed through what had formerly been the parking lot. Although the beamway's route was not altered, a significant amount of construction was done around the existing beamway, and much of the terrain under the beamway's support columns was regraded, necessitating the closures. Additionally, the Disneyland Hotel Station and all of its nearby hotel structures were completely demolished and a new station built in the same location. Downtown Disney Station is treated as a second gate into Disneyland Park, so a general admission passport or valid annual pass must be presented to ride the monorail and the tail-cone tour is no longer offered. The system resumed limited shuttle operations in 2000, when the Downtown Disney Station became operational, but a significant portion of the beamway was still unusable due to construction. In 2001 the monorail resumed full capacity forward direction circuit operations, passing through Disney's Grand Californian Hotel & Spa, as well as showcasing the new park. A Disneyland Monorail sports a new look in honor of the return of the subs. In 2004, Monorail Orange was removed from the line and taken to Walt Disney Imagineering in Glendale to be reverse engineered. Monorail Blue was removed in September 2006 for rebuilding. The Finding Nemo Submarine Voyage show building was extended into the lagoon beneath the monorail, which closed from August 21 through late December 2006 to prepare for the 2007 opening of Nemo. The refurbishment from Mark V to Mark VII was done one train at a time. There was no Mark VI at Disneyland, as Mark VI are used on the Walt Disney World Monorail System. The first Mark VII train, Monorail Red, arrived at Disneyland on December 20, 2007. It was originally expected to be in service by the end of February 2008, but due to design change issues, it did not begin serving park guests until July 3, 2008. Mark VII Blue arrived on-site on April 10, 2008, began daytime riderless testing on August 1, 2008, and began guest service on September 16, 2008. Monorail Mark VII Orange arrived on-site on August 14, 2008, began riderless testing in March 2009, and began guest service on April 7, 2009. The entire Mark VII Monorail fleet consists of three trains — Red, Blue, and Orange. In May 2012, the monorails received new decals, depicting eyes and a mouth covering and below the front windows, to tie in with the opening of the Cars Land section of Disney California Adventure. Each train was given a new name and unique narration, depicting the trains as if they were in the Cars film universe. Monorail Red became Manny Monorail, Monorail Blue became Mandy Monorail, and Monorail Orange became Mona Monorail. By the end of January 2013, the decals had been removed and the trains were running with standard narration. The Disneyland Monorail has two stations: one in Tomorrowland, and another in the Downtown Disney district. The original Monorail was a round trip ride with no stops. In 1961, the track was expanded to connect to a station at the Disneyland Hotel, making it an actual transportation system. The original Hotel station was torn down in 1999 and a new station, now called the Downtown Disney Station, was built in the same place. All riders must disembark at Tomorrowland Station, and during peak traffic periods, the monorail offers only one-way trips where all passengers must also disembark at the Downtown Disney Station and re-board for the return trip to Tomorrowland. Admission to Disneyland Park must be purchased to ride the monorail. In the fall of 2006, the Tomorrowland Station was remodeled due to the Finding Nemo Submarine Voyage construction. The original speed ramps were removed, and a new concrete ramp was added on the east end of the station to handle the queue and access to the station, with concrete stairs on the west end to handle the exiting Monorail passengers. The monorail travels in one direction only. All passengers board at a single platform. Leaving Tomorrowland station, the monorail crosses the Disneyland Railroad and continues along Harbor Boulevard on the eastern edge of the park. Turning to enter Disney California Adventure, it passes Monsters, Inc. Mike & Sulley to the Rescue! and the Sunset Showcase Theater. The track then crosses through the gateway to the Disney California Adventure park. Passengers can see Disneyland Park on the right and Disney California Adventure Park on the left. The monorail then passes through Disney's Grand Californian Hotel & Spa then makes a sharp curve to the right and enters the Downtown Disney station, which has a rainforest theme, covered with several jungle-themed canopies, to complement the adjacent Rainforest Cafe. Downtown Disney station has one platform. After a five-minute loading, the train leaves Downtown Disney and makes a short loop around the district before crossing above the esplanade between the two parks and heads back to Disneyland. Once inside the park, the monorail crosses the railroad again and goes into a series of sharp bends and curves around Tomorrowland. The track travels above the Submarine Lagoon and Autopia. The track actually crosses the lagoon four times. The track then curves around the Matterhorn Bobsleds, giving a view of Fantasyland, then turns left to reenter the Tomorrowland Station. All monorails are equipped with Grover 1056 2-chime air horns. The horn must be sounded twice when departing a station, at one point where the track parallels the currently unused PeopleMover/Rocket Rod track, and when approaching the Matterhorn. They are also sounded when a bird lands on the track, and as a greeting to passing Disneyland Railroad trains near the switch to the barn. The original monorails were equipped with horns that sounded more like real ground-level trains. The original red Mark I ALWEG Monorail train, with one car added, then designated Mark II. Both trains were specially created for Disneyland. The other train was blue but otherwise identical. Seen at the Disneyland Hotel station in August 1963. The blue Mark II ALWEG Monorail train. Seen at the Disneyland Park station in August 1963. "Monorail Shop", as it is officially known ("Shop" for short), is Disney's monorail maintenance facility located behind "it's a small world" at Disneyland and provides space for four monorails on its upper level (the bottom level houses the five steam locomotives that circle Disneyland). Monorails access this yard by stopping at the switch near the road crossing and then the switch will switch to the facility spur. Then the monorail travels slowly into the yard where another switch leads it into the designated track. No train will ever be left outside the facility because routine maintenance is performed nightly. The Diesel/hydraulic powered "work tractors" are primarily used each morning for beam inspection and maintenance-of-way which includes trimming vegetation beyond the reach of guests, cleaning and repairing the electrical commutator rails as well as periodically scheduled servicing and painting of the concrete beam guideway. They are powerful enough to return a fully loaded train fitted with tow-bars to a station platform, then to the Monorail Shop, independent of 600 V track power. In order to remove old monorail trains and replace them with new ones, they are shunted to maintenance shop beam "D" where each car segment is prepared individually for removal by supporting the remaining segment and disconnecting the bellows, cables and articulated motor truck. The car is then rolled outside along the beam to a position where a custom crane-hoist harness is fitted to it and the car is hoisted off the beam and transferred to a truck trailer on which a transport beam is bolted. The Diesel/hydraulic tractor (pictured) is used as a switcher to carefully tow each car into and out of the maintenance shop. The procedure is reversed for fitting new segments of monorail train cars to the beam while testing each system and connection. Each fully assembled train is then slowly and methodically tested thoroughly over many months before it can be placed into revenue service for guests. It was determined after delivery of Mark VII Monorail Red that platform clearance was too tight for the new, elongated end-compartments, so Monorail Blue was modified at the manufacturer and entered service before Red . Emergencies requiring train evacuation will be handled differently depending upon the location of the train and the nature of the emergency. If a train is stopped at a station platform or at the work platform, guests can exit the train onto the platform. Exiting a train is possible even when the doors of the train cars are closed. A cast member outside the car can also forcibly open the rightmost door panel of the car by releasing the air pressure holding that panel closed. The air pressure release is a handle beneath the rectangular center window that is similar in appearance to a car door handle. If a train is stopped on open beam, then guests evacuate through emergency exits located in the roof of the train. Guests open roof hatches by first removing decorative plastic from the ceiling above a bulkhead footstool and then by lifting open a hinged hatch that will flip across the bulkhead dividing two train cars. Guests evacuate to the roof by climbing through the open hatch onto the top of the train. The bulkheads separating cars are designed as firewalls that will contain a fire within a car to just that car. The open hatch allows guests in the affected car to transfer to an adjacent car where they can safely wait for evacuation by fire response crews. If the emergency affects the entire train, then guests are evacuated to the surface of the beam. Guests again open the emergency roof hatches, but do not simply move to the adjacent car. Instead, they use a small handrail present along the top of each train car to move all the way to the front of the train. The Disneyland Fire Department assists in the safe evacuation of the disabled train. Platform gates are operated manually and remain closed until the next train arrives and cast members determine that it is safe to board. The trains are powered by 600 V DC electric current, drawn from a small rail (bus bar) running along the right side of the beam. This bus bar is similar to the electrified or "third" rail of a subway train. Ride system: Each train is propelled by six DC electric motors each mounted in articulated powered trucks shared between cars, not just the lead car. Oversized ceremonial scissors failed to cut the ribbon during the televised opening ceremony, so Walt simply tore it. Built at Disney Studios. Based on Alweg monorail systems and concepts. Entirely new design and physical hardware. No re-use from Mark I & II. colors: red, blue, yellow and green. Seats 24 passengers in each of the five cars, plus 7 passengers in the tail cone, and 5 passengers with 1 driver in the nose cone. Utilizes Mk III chassis as re-engineered by Ride & Show Engineering, Inc. of San Dimas,CA. The Mk V was designed to resemble the appearance of the Mark IV series monorails which were operating in the Walt Disney World Resort. Monorail Orange, a Mark VII monorail, passes over the lagoon in Tomorrowland at Disneyland. Sleek/Retro design accomplished by installing a Mark III style nose on the existing Mark V trains. New island seating configuration, with one row of inward-facing seating at the front and rear ends of each car. The tailcone has a capacity of six passengers while the nosecone has a capacity of four passengers and a pilot. Colors: Red, Blue, and Orange. 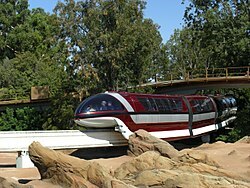 The first Mark VII monorail, Red, was delivered to Disneyland on December 20, 2007. It began service on July 3, 2008. The second Mark VII, Blue, was delivered to Disneyland on April 10, 2008. It began service September 16, 2008. The Third Mark VII, Orange, was delivered to Disneyland on August 14, 2008. It began service on April 7, 2009. ^ "Monorails of North America: Disneyland, California". The Monorail Society. Retrieved 2016-09-21. ^ a b Ballard, Donald (2008-06-08). "Mixed Bag". The Original Disneyland Hotel. Retrieved 2016-09-21. ^ Tully, Sarah (May 18, 2012). "Disneyland Monorail trains get 'Cars' makeovers". The Orange County Register. Retrieved January 28, 2012. ^ Tully, Sarah (2007-12-20). "New monorail arrives at Disneyland". The Orange County Register. Archived from the original on 2007-12-24. Retrieved 2007-12-20. ^ MacDonald, Brady (July 3, 2008). "Disneyland Monorail Red debuts tonight". The Los Angeles Times. Archived from the original on October 2, 2008. Retrieved 2008-07-03. Kurtti, Jeff; Hunt, Vanessa (2019). The Disney Monorail: Imagineering the Highway in the Sky (1st ed.). Disney Editions. ISBN 978-1484737675. Wikimedia Commons has media related to Disneyland Monorail System. "Disney Pix" - Monorail History - A complete history of all the Disney monorail car designs in pictures. Amusement rides manufactured by Ride & Show Engineering, Inc. This page was last edited on 5 March 2019, at 19:27 (UTC).